Hulk Hogan opened the show and welcomed everyone to the event. He announced that Austin Aries would in fact be defending the X-Division Championship against Samoa Joe. Aries defeated Joe in the opening match with a modified Brainbuster (modified because of Joe’s weight on Arie’s back). ^Who cares about Joe’s weight? Hogan and TNA made the right call by allowing this match to be for the title. When Joe is competing at the top of his game, the X-Division is where Joe shines the most. There really wasn’t a better way with the current roster to kick off TNA’s ten year anniversary than with these two guys bringing the crowd to life and getting them hot for the rest of the night. Great matchup and the real definition of what the X-Division is all about. Hernandez hits the big splash from the top rope to defeat Kid Kash. ^It’s been talked about that Hernandez has impressed TNA officials with his physical conditioning and is now in line for a push when he returns to weekly programming. This was a well worked match between these two and it definitely got my attention. I will have to admit that I considered this a filler match when I first heard about it, but now I feel that it really contributed to the rest of the card. Garett Bischoff and Devon defeated Robbie E and Robbie T when Devon nails the spinebuster on E and gets the pinfall. ^I’m glad that the TV Title has become a relevant part of TNA storylines, and I’ll say again that I’m glad the title wasn’t on the line for the pay per view. Garett is a long way from being a big star, but working with a guy like Devon is definitely a bigger advantage than most guys get when they break into the business. I didn’t expect this match to be anything standout, but it definitely did its job and kept the storyline going for these four men. Mr. Anderson defeats Rob Van Dam and Jeff Hardy to become the new number one contender to the World Title. Anderson hits the mic check on RVD to get the pinfall win. ^These three men put on a great triple threat match. They incorporated one another into three man moves and pin attempts, and they kept the pace of the match high throughout its entirety. I was very impressed by what these three brought to the table and I’m looking to seeing Anderson challenge for the World Title this week on Impact. James Storm returns and answers Crimson’s open challenge. He defeats Crimson with the last call superkick to end his undefeated streak. ^Longnecks and Rednecks! I don’t many people were expecting James Storm to return so quickly, and now you have to wonder how quickly he will go after the World Title. As for Crimson’s streak, the darn thing was overrated and ridiculous. The guy can’t wrestle his way out of a paper bag as far as I’m concerned. This guy should join Kevin Nash on the independent circuit and maybe they’ll both realize they buy into their own hype just a little too much. Great to see James Storm back in action! Dixie Carter comes out and thanks the fans for making TNA what it is. She thanks Jeff and Jerry Jarrett and everyone who has competed in TNA, past or present. She then announces the first inductee into the TNA Wrestling Hall of Fame, Sting! ^In my eyes, the only guy who deserves this honor as much as Sting would be Jeff Jarrett. Jeff put a lot of guys over and carried the NWA World Title as a true heel for many months/years in the very early days of TNA Wrestling. He headlined main event after main event and worked hard to create a company that could eventually be put on the map as a recognized and established pro wrestling organization. That aside, Sting has had more memorable moments and matches in TNA and has worked his tail off to keep a second company afloat to try to go against the machine that is known as WWE. Sting has helped shape the company into what it is today and is very deserving to be the first person inducted into the TNA Wrestling Hall of Fame. Miss Tessmacher defeats Gail Kim to become the new Knockouts Champion. ^First of all, Brooke Tessmacher is now being referred to as Miss Tessmacher for two reasons. The first reason is that TNA doesn’t want two Brookes now that Brooke Hogan has arrived in TNA. Second, Tessmacher was a former Miss America and it’s fitting for her character. These two have wrestled better matches together than this one, but this was still a solid contest and represented the knockouts division well for TNA’s tenth anniversary PPV event. Joseph Park defeats Bully Ray. Park rolls under the ring and “Abyss” rolls out the adjacent side. “Abyss” slams Ray through a table and then rolls back under the ring. Park comes back out from under the ring and gets the pinfall on Ray. ^This just in: Joseph Park is Christopher Parks (Abyss). The guy who came out from under the ring was from TNA developmental. He was wearing the same pants as Park but the stripe was different on the side. He wore the Abyss jacket and covered his face. It would have been far too time consuming for Park to change under the ring to pull this whole stunt off. The match itself was for entertainment, and so a pure wrestling fan may not have loved the encounter. As a fan of both wrestling and the business of sports entertainment, this match was perfect for what it was supposed to be. Christian Cage is introduced by Hulk Hogan. Christian talks a little bit about TNA’s history and introduces TNA’s number one moment in history: the clip is Sting’s return to TNA in January 2006. ^So TNA negotiated an appearance by Christian after allowing Ric Flair to appear at the WWE Hall of Fame ceremony. I like the move. Rumor has it that Christian wasn’t happy about having to appear at the show. It really doesn’t change anything overall; it shouldn’t have any ridiculous effect on buyrates for the ppv event. It was cool to see Christian back in a TNA ring; I just wish he had worn the IC Title belt. The number one moment in the company’s history was interesting to me. I would’ve chosen either Joe defeating Angle at Lockdown 2008, or I would’ve picked Styles over Jarrett in 2003 for the NWA World Title. The only thing more fitting would have been Christian defeating Jarrett at Against All Odds to capture his first ever World Championship. AJ Styles and Kurt Angle defeat Kazarian and Christopher Daniels and become the new TNA World Tag Team Champions. Angle forces Kazarian to submit to the ankle lock. ^Despite the X-Division opener being a great contest, this tag team match was the best overall wrestling match of the night. These four men did what they do as well as the best performers in this business and delivered an incredible tag team matchup. It’s interesting for Styles and Angle to hold the titles; I don’t think their reign will last long as both men should be in the World Title scene. TNA needs to drop the AJ/Daniels rivalry and let these guys start something new. 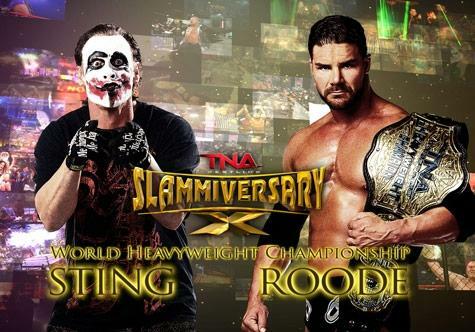 Bobby Roode defeats Sting to retain his World Title. Roode cracks a beer bottle over Sting’s head behind Hebner’s back and gets the pinfall. Sting attacks Roode after the match and drops him through a table by the stage to close the show. ^Roode needed to keep the title. Sting needed to be the last man standing when the show went off the air in order to promote his Hall of Fame nod. The match was short, but I think it’s because the card wasn’t planned out well in terms of time left for the main event. I was expecting more from this match, but it wasn’t that bad if you go back and watch it again. It felt somewhat anti-climactic compared to the match before and I maybe question if the two matches should’ve switched spots on the card. The only thing that could’ve made this show better was if the triple threat had been dropped and the King of the Mountain had been brought back for the World Title match. Aside from that, the card was completely solid and worth every penny for those who ordered the show. On a final note, I’ve decided to recap Impact in its own column starting this week. Smackdown will become abbreviated and moved into my weekly rundown column that I put out on Saturdays. Make sure to look for it later this week. Until next time, you’ve been ThunderStruck!